Local businesses have an opportunity to build brand visibility and create good will amongst the public by partnering with Rotary. Solving real problems takes real commitment and vision. For more than 110 years, Rotary's people of action have used their passion, energy, and intelligence to take action on sustainable projects. From literacy and peace to water and health, we are always working to better our world, and we stay committed to the end. The Rotary Club of Great Neck has been working tirelessly since 1953 to address the most pressing needs of our community and across the world. 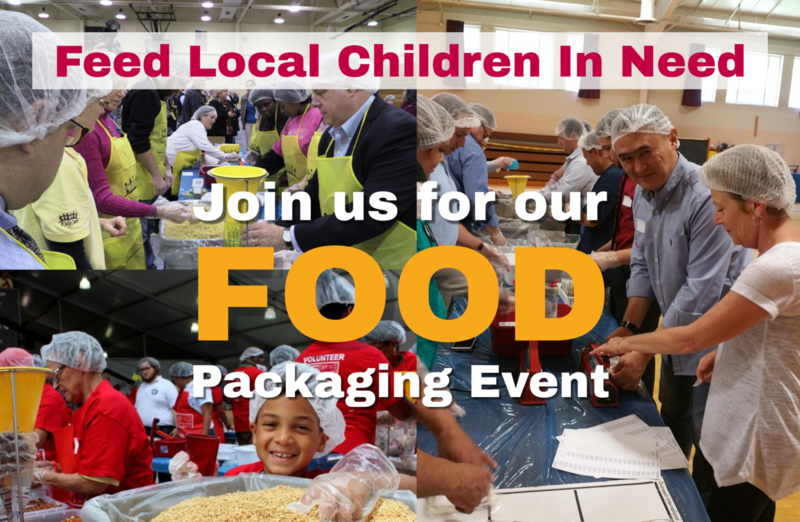 For this food packaging event we will be printing and distributing to volunteers over 100 t-shirts. Thanks to our strong relationships with local media, our events are covered by local TV and newspapers, and we will ensure our sponsor's name and logo is prominent in that coverage. Additionally, our Facebook posts reach hundreds of users; our most recent Facebook fundraising effort reached over 850 people in the Great Neck area. Your business name printed prominently on the back of over 100 t-shirts with the title "Official Sponsor". Your logo and company name included in all digital flyers distributed via email to our network of over 1,300 Rotarians across 76 clubs in all of Long Island, Queens and Brooklyn. Your logo and company name on our website's front page for 3 months. Your logo included in a 1 month Facebook ad campaign. If desired, we will display your business banner (as provided) at the event. Your business name printed prominently on the back of over 100 t-shirts with the title "Sponsor". Your logo and company name on our website's front page for 2 months. Your business name printed on the back of over 100 t-shirts with the title "Sponsor". Your logo and company name on our website's front page for 1 month. Rotary Club of Great Neck Foundation is a non-profit 501(c)(3) based in Great Neck, NY, whose mission is to work to promote healthy childhood development, combat food insecurity and provide relief to the less fortunate in Long Island and abroad. Donations are tax deductible. The Outreach Program is a non-profit 501(c)(3) based in Des Moines, Iowa, whose mission is to provide safe water, food, medical care and education to children and those in need at home and abroad.